Within the world of design there is frequent debate over the ethics that sit behind design process and what is sometimes called ‘design thinking’. Design thinking seeks to solve problems, make things better and create new opportunities. But who defines the problem? Who are we making things better for? And who benefits? At the heart of this debate is a shift within the industry from ‘prescription’ to ‘exploration’, from ‘participation’ towards ‘co-production’. This means a whole-hearted handing over of the reigns, a shift of not just responsibility but also of power and (crucially) of resource. This all sounds well and good but in practice can be tricky, especially when it comes to housing. The provision of housing is complex, requiring different actors to work together (some with a high level of technical skill), through complex processes and legal structures. At Transition by Design, we believe that cities should, as much as possible, be made by the people that live in them. We believe that citizens have not just a right but a responsibility to help shape the places in which they live, and to see themselves reflected in the city around them. This must not exclude the people for whom life in Oxford is most difficult; those people who are experts by lived experience, of homelessness, isolation, poverty and discrimination. Concerned citizens take part in an ‘open space’ meeting on what do do with Oxford’s empty shops? People experiencing homelessness or poor-quality housing are rarely included in decisions that are made about the provision of housing. 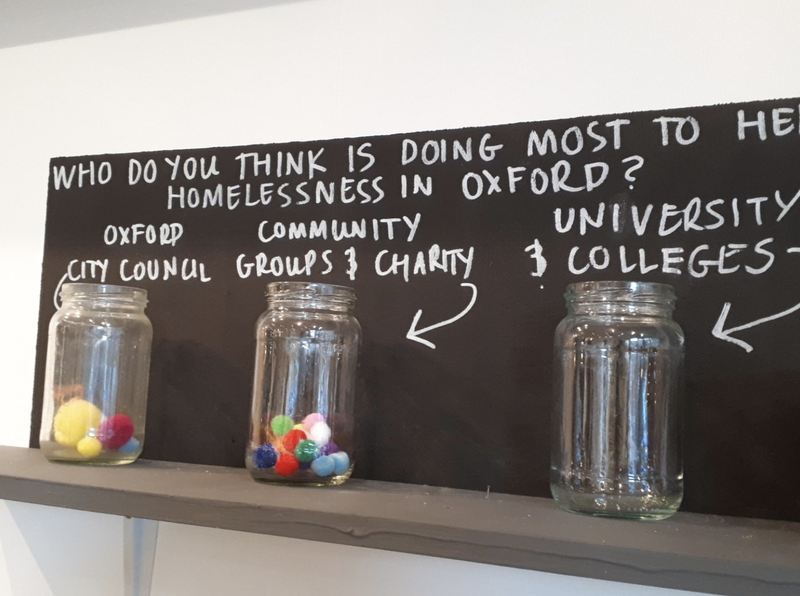 In fact, people experiencing homelessness or poor-quality housing are rarely included in much of Oxford’s public life, partly because a lack of space to do so. Public spaces that are truly public are in decline and the reality is that unless you are affiliated with the university or able to spend £3 on a flat-white then there are very few places other than the street that are seemingly for you. Working with people experiencing homelessness you begin to see how these people begin to identify instead with the services they access. If the structure in your life and your friendships are based around your GP, social services or homeless day services then it’s not hard to see how your identity becomes reduced to ‘drug user’, ‘complex needs’ or ‘homeless’. This isn’t healthy for anyone. 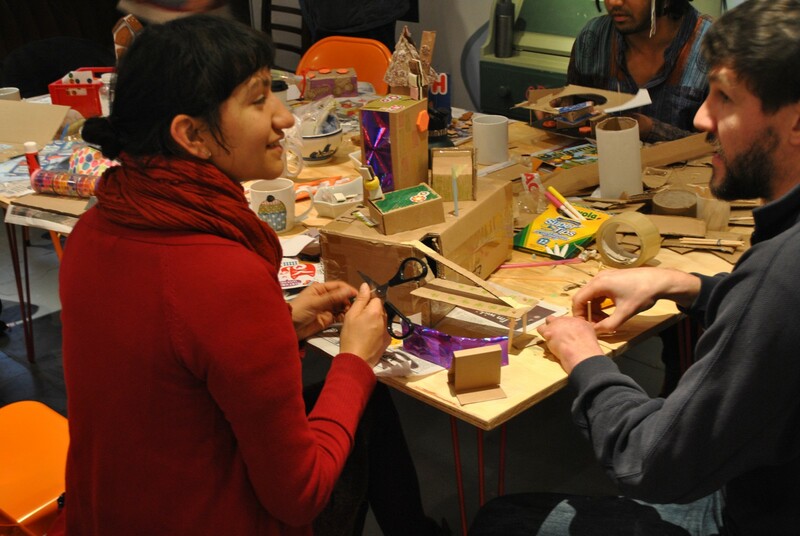 Volunteers use arts, crafts and participatory mapping to help people feed into a planning consultation. We need more public space. Public space is where we as citizens fit ourselves into the narrative of the city, where we meet people different to ourselves, shape opinions and learn who we are — as individuals and as a collective public. By adding a status or a price tag to such space, we exclude people and infer that certain behaviours and appearances are welcome and others not. In doing so we deprive some of the ability to belong. All too often these exclusions happen along the unwelcome but often familiar lines of race, ethnicity and class. We can do better, and if we do, we will all feel the benefits. In late November 2018, we transformed an empty unit on Little Clarendon Street, a busy shopping street in Central Oxford into a shop which doesn’t sell anything called Open House. By creating a space that is actively welcoming to people without a permanent home and including them in the conversations that are being had about housing in the city, can we encourage a movement to create a fairer housing system that has a lived experience of homelessness in its DNA? Shelves on the wall allow visitors to see what others think on crucial topics. A moment spent online, on the bottom half of the internet is enough to understand how much people have to say about housing and homelessness. Affecting us all, housing is an emotive issue and conversations can be full of anger, guilt, blame and hopelessness. But these are conversations that must be had in order to understand the system in which we all live, a system where some have spare bedrooms whilst others sleep on the street. // We found a high level of undiagnosed autism and learning difficulties, so we created a spectrum of different environments within the shop. Some areas are loud, bright and social whilst others are quiet, softer and calm. We’ve designed a number of different ways to take part in activities and conversations including speaking, listening to recordings, drawing, painting, crafting and writing poetry. // We know some of our guests are existing on or well under the poverty line so everything is based on a ‘use what you can and replace what you need’ basis. No one needs money to be in the space and we also refund people’s bus tickets. // We know a lot of households on the waiting list for council housing are bringing up small children in temporary accommodation and/or with little space to play. So, we have a whole kid’s area with ample space to jump around, get messy, do your homework or read a book. // We know a lot of people, regardless of their housing experiences, find it difficult to talk to strangers, especially people they consider to be different to them. We asked people where some of their best conversations happened and where they found it easier to talk. Based on this, we found a table football table, jigsaw puzzles and made a huge arts & crafts table. // We know there is stigma around homelessness and especially rough sleeping, so we’ve made the needs of these people as welcoming and simple as possible; such as charging a phone, using the loo, making a cup of tea or filling a hot water bottle. Regular ‘Housing Matters’ panel discussions debate the big topics on housing and homelessness. Designing Open House has thrown up a number of design challenges; in the physical space, the operation and in the broader systems surrounding housing and homelessness in Oxford. We’ve been working with Interior Architecture students from Oxford Brookes University to interrogate the idea of the ‘threshold’, getting people over the doorstep both physically and metaphorically. Open House is a very simple but rather alien idea; an interior bit of public space where you don’t have to spend money to enter. Some visitors take to us like a duck to water, inhabiting and enjoying the space with ease as if it were their own. Others can take a few passes by before they decide to be brave and come in. They might feel an awkwardness and take a little longer to find their place in the shop. Conversation often uncovers the former as having a lived experience of homelessness or precarious housing and the latter to have never felt the need for a space like ours — because they’ve always had it, at home. Another border we are exploring is that of ‘homeless’ or ‘not’. Many of our visitors report a spell of homelessness leading to an erasure of identity. Once you’re ‘homeless’, you’re no longer anything but ‘homeless’ and ideological segregation leads to a spatial segregation. Spaces for ‘homeless’ people have rules whilst spaces for ‘non-homeless’ people don’t. In a space for ‘homeless’ people you’re a ‘client’, a ‘user’ or a ‘member’ whilst in space for ‘non-homeless’ you’re a ‘customer’. At Open House we are deliberately trying to challenge these binaries in a way that keeps everyone safe and comfortable. We’re constantly experimenting with what it means to be ‘community-led’ and are working with Llankelly Chase to see how this could stretch even as far as our social impact assessment; which we’re approaching through the co-creation of a ‘zine’, produced with our volunteers and visitors. These are live design challenges and we welcome anyone who would like to help us explore them. Visiting Open House today you’ll find a people-led factory for fairer housing. From Wednesday to Saturday between 10–5 the shop becomes a sort of public living room; a homely space for people who don’t have much have that at home. In building Open House, we wanted to build a space that deliberately confused the boundary between a space for people with a home and a place for people without a home. We wanted to distort what have become some fixed spatial signifiers within places where people experiencing homelessness access services or socialise. We wanted to create a space that was actively welcoming to people without a home and fill that space with conversations on how to make a better, safer and fairer housing system for all. The logic is simple. 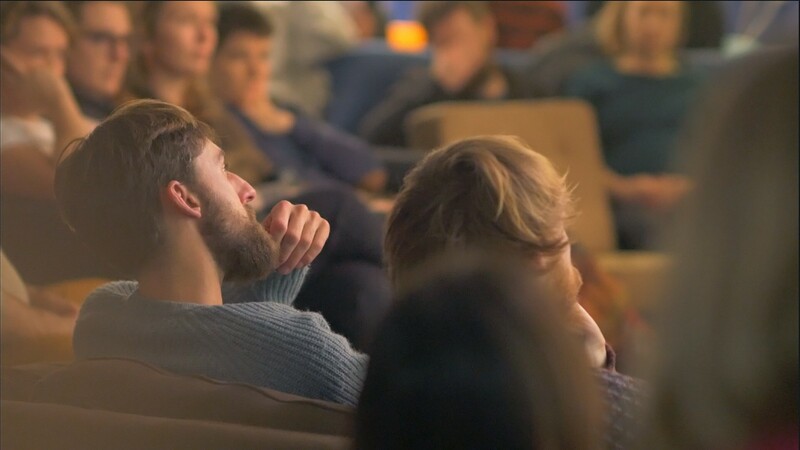 We believe that if you place the people who are suffering most from the current system at the heart of creating a new one then we have a much better chance of creating something that works for everyone. Open House will be open for one year — we‘re open to everyone and we can’t wait for you to join us. To stay up to date you can sign up to the mailing list, visit our website, or follow us on Facebook, Instagram or Twitter. We’re totally volunteer run and always looking for new recruits. We also love it when people come to us with an idea for an event or workshop they would like to run. You can see examples of past events and what’s coming up on our What’s On page. 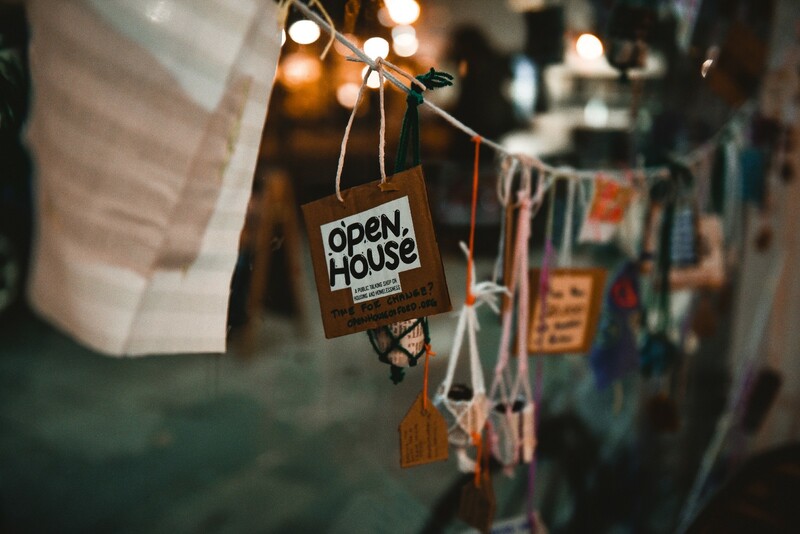 Open House builds on Transition by Design’s previous work on housing and homelessness and the Homemaker Oxford research programme which is exploring how alternative models of community-led housing delivery might help meet extreme housing need in Oxford. The project has been enabled by Makespace Oxford CIC who has managed the tenancy and enabled us to access the property at 36 Little Clarendon Street. This would not have been possible without the invaluable support of Paul Roberts, CEO of Aspire Oxford. 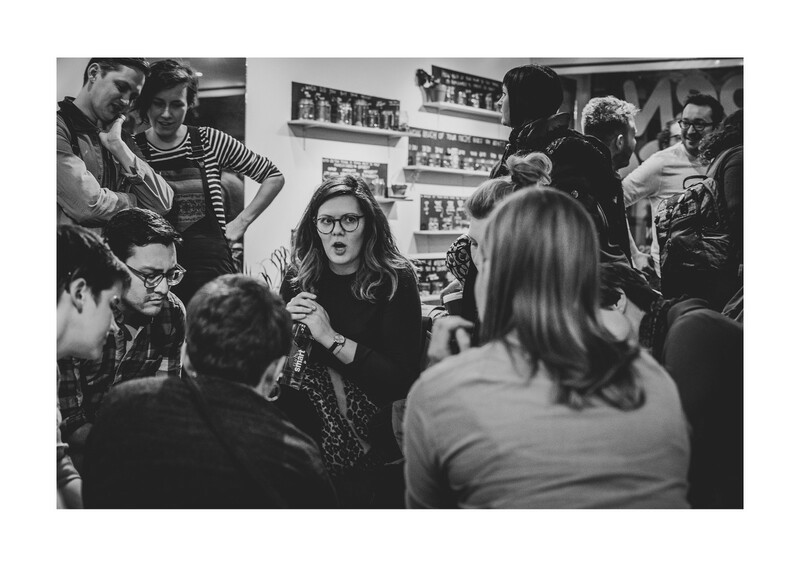 Open House has been further supported by Aspire Oxford both through their role as a Director of Makespace Oxford and their professional support to the Open House team, volunteers and visitors. We have had expert support and advice from Monchu on branding and graphics, Maff and Jenny at Camerados, Sam Hamper on video production, Richard Rowley on graphics and the Oxford Poetry Library on programming and events. A final and huge thanks to all of our brilliant volunteers without whom the project would simply not be possible.